Jim McGuinness won All-Ireland titles as a player and a coach. 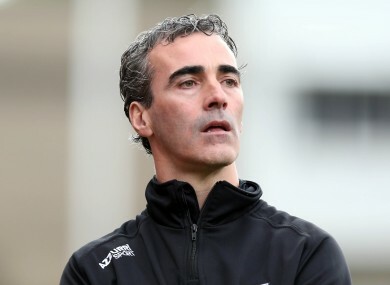 DONEGAL COACH JIM McGUINNESS has revealed that a move to professional football, and Glasgow Celtic, ‘wouldn’t be something that would scare me’. McGuinness, who coached Donegal to All-Ireland Football Championship success last month, insisted he was happy to remain with the county, in an interview on Highland Radio’s Shaun Doherty Show, but he is open to further challenges in the future. The 39-year-old trained League of Ireland First Division side Finn Harps for a season before, as well as coaching Derry City and Limavady United. He supported Arsenal and Celtic ‘growing up’ and was delighted to get an invite to attend the Glasgow club’s training facilities the day before he watched them take on Benfica in the Champions League. The day before, I was invited over to the training grounds, got a look around (there), met everybody. Fantastic people there from recruitment, talent identification, conditioning, the coaches themselves and the facilities. During his time in Glasgow, McGuinness had ‘a nice chat’ with Celtic coach Neil Lennon about player recruitment and preparation. It is very flattering if that is the case but, from my own point of view, I’m coming from a sports science background so to go over there was a good experience. He added, “If a professional football team or any professional sporting organisation come in and say that they are interested in working with you … it is obviously something you would have to (consider). I’m a young man with three kids, I’ve got a young family, it is obviously something you’d have to consider. The Donegal coach pointed out that his background is sports science and psychology and he is keen to keep up his work in those fields. McGuinness added that golfer Paul McGinley had extended a similar invite for him to go along to the Irish Open earlier in the year and see the preparations and science behind golf conditioning and analysis. He revealed that McGinley sent him a text after the Ryder Cup win of the European team, of which he was vice-captain, on 30 September. “He said it was like being 10 points down by half-time and winning the match by a point,” McGuinness remarked. McGuinness stated that his aim was not to win a solitary All-Ireland with Donegal but to win ‘three or four’. “Donegal is where I’m from. It’s my love, my passion,” he added. Email “Jim McGuinness not scared of Glasgow Celtic coaching role”. Feedback on “Jim McGuinness not scared of Glasgow Celtic coaching role”.